Quidamo has the finest jumper genes, and demonstrates what the sport of show jumping is all about. Fast reflexes, a top bascule and unlimited ability make this smart Quidam’s Rubin son a sure bet. 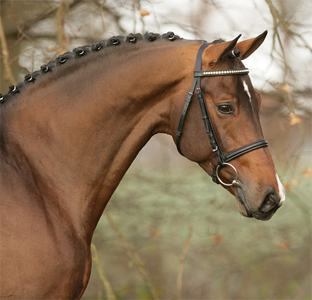 Quidamo was the best jumper stallion of the year at the 15th NRW main licensing in Münster-Handorf in 2005, and also had the best scores of all stallions at the 30-day test in Schlieckau in December 2006 where he was the best in jumping. He was already a highly successful youngster, winning and placing in medium (M) level classes. He fulfilled the requirements for licensing by qualifying for the 2008 Bundeschampionate in Warendorf, and has meanwhile arrived at the upper level national/international scene by winning and placing in advanced level classes. There were many premium foals in his first crop, and the most expensive foal at the NRW Auction in 2007 sold for 20,500 Euros. 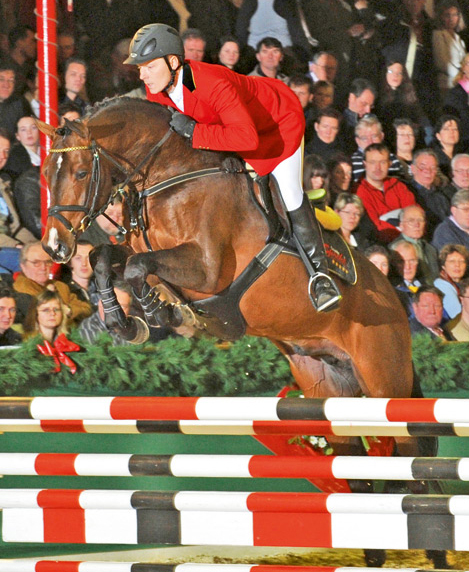 In 2007, Quidamo was awarded a Main Premium in Vechta. His eldest offspring are brilliant in their first free jumping tests and were successful in tests for young riding horses in 2010. Several daughters from his first crop received a State Premium. His sire Quidam’s Rubin won his stallion performance test and quickly established himself in breeding while he was still young. A number of licensed sons have left licensings in several breeding areas with Premium and State Premium candidates as well as top foals again and again in all breeding areas quickly made him a main sire. In 2004 he won the Oldenburg main premium for stallions with emphasis on jumping. His dam, Lambada, also produced another son licensed in 2008 named Cheval de Coeur (by Coupe de Coeur) who brought a record price at the Mecklenburg licensing in Redefin and is stationed at the State Stud in Sachsen-Anhalt. The dam's sire, Lafontaine, was successful up to advanced (S) level in show jumping with Hauke Luther (also internationally, for example on courses at the Hamburg Derby) and his first offspring now hold their ground on advanced level courses. In the following generation you find Sao Paulo, one of the most successful licensed Sandro sons. Sandro sired excellent horses for both disciplines such as Sao Paulo in show jumping or the dressage World Champion, Satchmo ridden by Isabell Werth. Along with show jumpers and dressage horses (up to Grand Prix), this mare family is also the origin of the dressage stallion, Gaetano S, a full brother of the great granddam. Through Nomade-Abhang I-Axtfeld-Flügeladjutant-Spinck-Almarich in the following generations, this sporty young stallion is a representative of the Hanoverian mare line 824/Sibara (by Schwarzenberg-Reinhart-Elector-Bosco) maintained in Artland. It is also known for the stallions Aberwitz I and II (State Stud Celle), Berlusco (State Stud Neustadt/Dosse), Contucci (USA), Fingal (private stallion Oldenburg), Goethe (private stallion Rhineland; internationally successful with Heiner Schiergen), Landsknecht I (State Stud Celle), Landsknecht II (private stallion East Frisia), Luristan (private stallion Hanover) and Winkel (State Stud Celle).